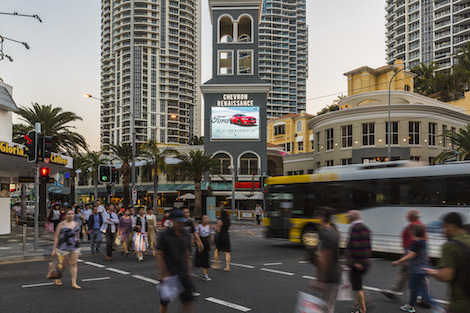 VMO, one of Australia’s fastest growing Digital Out-of-Home providers, has just unveiled a large format digital outdoor billboard directly facing busy Surfers Paradise Boulevard. VMO claim that it is Australia’s first ‘smart’ outdoor screen, ie. an outdoor screen embedded with ‘Audience Measurement Device’ technology – remember from previous posts that this is used to measure audience engagement via VMO’s real-time audience measurement system DART (Digital-Outdoor Audience in Real Time). Anthony Deeble said “It’s a clear point of difference for VMO over our competition. For the very first time, advertisers in this space will have access to real-time audience data – marking a shift away from historical data in outdoor. Soon, historical data will no longer be acceptable for large format outdoor.”. Designed for maximum impact, the new screen is a staggering 24 square metres (6m wide x 4m high). Strategically placed on the façade of the Chevron Renaissance Shopping Centre, the site will anonymously measure live pedestrian traffic and use facial recognition to detect people in vehicles. The VMO Shop portfolio has increased to 410 locations reaching a fortnightly cumulative audience of over 50 million people. The network now includes 62 premium large format screens across the country. This entry was posted on Wednesday, October 18th, 2017 at 16:28 @728 and is filed under DailyDOOH Update. You can follow any responses to this entry through the RSS 2.0 feed. You can leave a response, or trackback from your own site.